Travel in the comfort of a private SUV with an expert Northern California born owner-operator. Clear English spoken. I have driven over 600 tours to Yosemite National Park over the last 10 years. Get a more personalized level of service not always available on crowded vans. Don't waste daylight picking up or dropping off other groups around San Francisco and Oakland. Pass the California Central Valley, Sierra Foothills and Gold Country on the way to Yosemite. 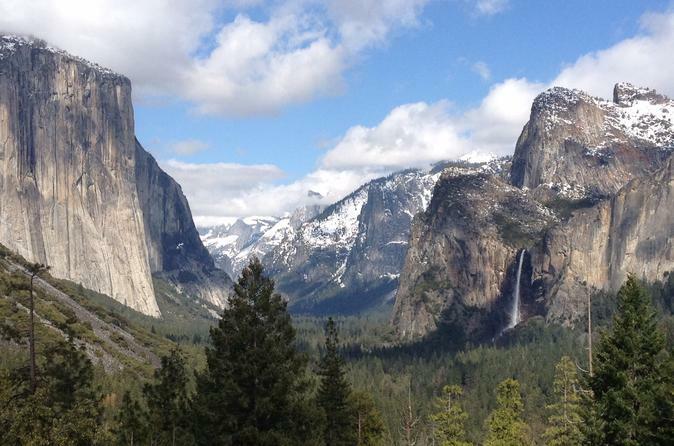 In the park, stops are made where you may photograph El Capitan, Half Dome, Bridalveil Fall & Yosemite Falls (seasonal). Free time is given near Yosemite Lodge at the Falls to explore, shop and snack. Swim in the Merced River, get in a hike or take an easy walk to the base of Yosemite Falls. Seasonal: You may also choose to leave The Valley 90 minutes early and visit The Tuolumne Grove of Giant Sequoia Trees (Hike 2.5 miles/4 km). Transportation is provided in a Ford Expedition EL XLT equipped with 4-wheel drive. This vehicle was selected for its size and 3rd row space which has more leg room than most other SUVs. Get there quicker! Yosemite offers truly amazing and memorable sights. A private tour optimizes your time. A big concern tourists face when deciding to go to Yosemite is the long drive. Being on a bus or van tour that spends the first and last hour picking up/dropping off around the city takes a good chunk of free time away from your day. Because of this, other tours are often rushed and time spent in the park is very limited. Don't spend it in a parking lot waiting on tardy strangers. Get more time for hiking, learning, swimming & photography. 11:30 Arrive at the Yosemite Park gates. Continue to the Valley for photo stops & free time near Yosemite Falls. 3:30 Depart Yosemite Falls for one last look at El Capitan on the way out of the park. *Times are approximate and depend on weather, traffic and time spent at stops. Its a lovely drive to Yosemite as the scenery is always evolving. After crossing the Bay Bridge, you will pass Oakland, the Altamont Pass wind farm and California's Central Valley. Farming towns and fruit stands between the orchards can break up the drive. We make our way up the Sierra Foothills into the mountains passing through a gold rush towns. Park gates are 3 1/4 hours from San Francisco on the quickest route (without delays or stops). Weather depending, you will be able to see the famous sights of the valley floor like El Capitan, Half Dome, Bridalveil Fall & Yosemite Falls (seasonal). Take free time near Yosemite Lodge. There you can purchase cold drinks, food & souvenirs. Walk along the Merced River taking photos of Half Dome & Yosemite Falls, take a swim in the Merced River or get some exercise by hiking a nearby trail. One of the most popular activities is walking up to the base of Yosemite Falls (may be dry late summer). Spring-Fall, you may depart The Valley early to hike the Tuolumne Grove. On the way out of the park, you might spot climbers from under the vertical face of El Capitan. A rest stop will be made at the half way point back to San Francisco.